One day, Rebecca and I will be ‘retired’ and on a beach in Maui. We’ll own a small taco restuarant on par with the likes of Maui Tacos and Surf Taco. We’ll grow our own avocados (uhh I paid 2 bucks for 1 avocado tonight; something is not right!) and continually make fresh guacamole. We’ll serve all types of tacos, burritos and the like. Heck, we’ll probably even open up a road side stand on the Hana Highway where we’ll sell fresh banana bread. One can dream, right? How do I do that by 30? We played the “what do you want for dinner? … I don’t know, what do you want? … I don’t care, what are you in the mood for?” game tonight. We settled with doing some kind of fajitas. Typically when we’ve previously made vegetable fajitas, the veggies were bland — maybe only a sprinkle of cumin and cayenne pepper. So we both agreed that these veggies tonight had to have some kind of flavor. 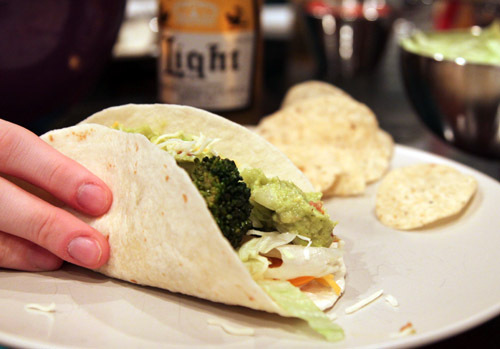 We briefly talked about using the packet fajita seasoning, but we both shrugged it off. 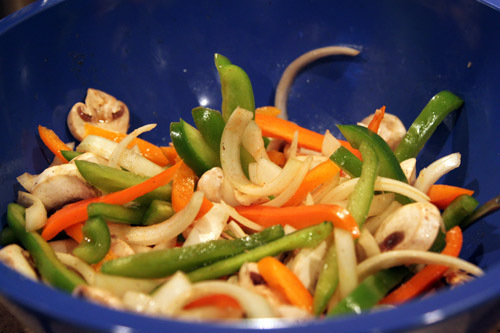 Rebecca had the vegetable fajitas at Jose Tejas the other night and loved them, so she set off to find a recipe. And sure enough a few seconds later, she found one and emailed me so I could pick up the ingredients. We settled on some peppers, onions, carrots, mushrooms and broccoli. These veggies would be cooked in the marinade provided by the Allrecipes.com recipe (btw, how come all recipe sites are horrible?). The marinade was pretty easy. I just combined the following ingredients. I let the veggies soak in the marinade a bit before I cooked them in a wok. I especially wanted the mushrooms to soak in the marinade knowing they would pick up, and hold, all the good flavors. 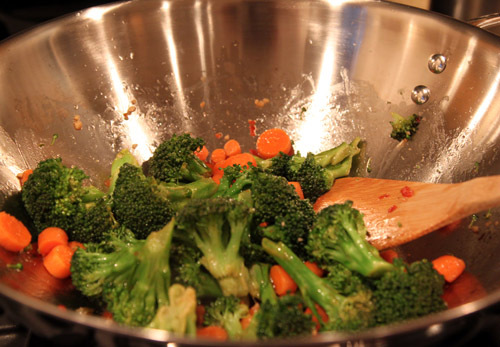 The broccoli and carrots were cooked for about 10 minutes first since they were the thickest and would need the most cooking time. 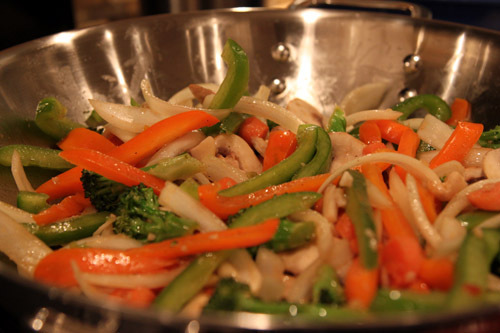 Once cooked, I added the remaining vegetables and cooked for another 10-15 minutes or so in the wok — constantly stirring. And after spilling a glass of water ALL OVER THE PLACE, we finally sat down to relax and eat our fajitas. And then Macky started SCREAMING for our attention. It’s never ending here at our house with our three needy, yet very lovable, cats. And to think, we almost adopted a little girl today too! Oh! 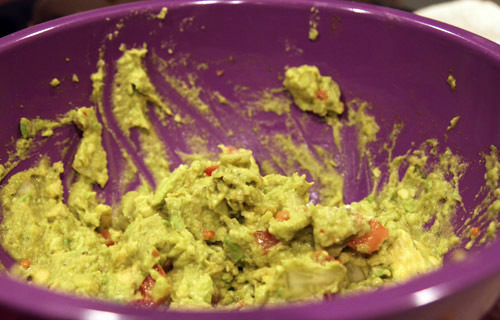 And I cannot forget about the fresh guacamole! 3 avocados (at 2 bucks each! 2 bucks! each! ), some diced onion, diced tomato, a squeeze of fresh lime juice, salt+pepper, and some cilantro! So good! As usual, we’re linking this up to What I Ate Wednesday at Peas & Crayons! 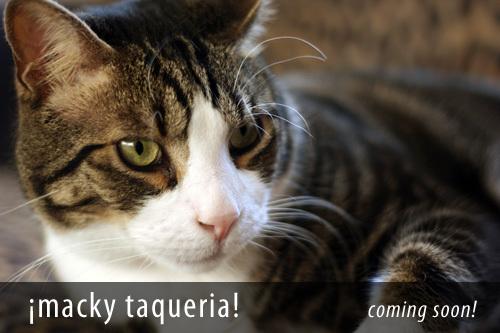 bahahahahaha macky taqueria!!!! love it!